EDIT – AUG 17, 7:00 a.m. – The audio volume was turned up and the recording replaced. This is probably best heard using headphones, if it is too muffled or low through speakers. A balance had to be made with so much background noise (including an ice-cream truck) and hearing Fr. Perrone’s words. They seem to get clearer several minutes into the recording. This was the homily of Fr. 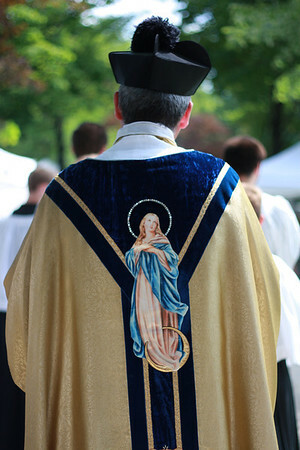 Eduard Perrone, pastor of Assumption Grotto in Detroit, on the feast of the Assumption of the Blessed Virgin Mary. 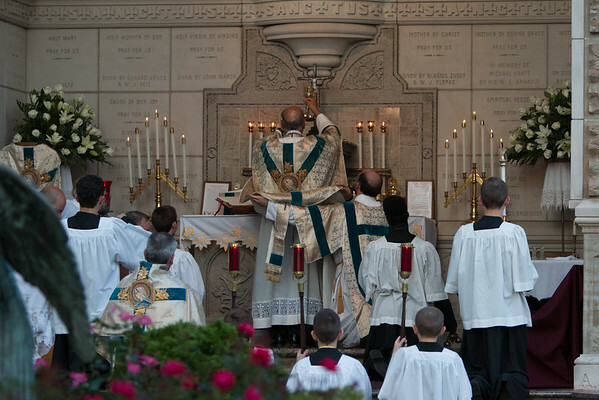 It was delivered at the evening outdoor Mass – a Solemn High Mass in the Extraordinary Form. The quality of this recording is lower because it was not a direct feed. There is a little more background noise, but the audio is definitely good enough for those looking to hear what Grotto’s pastor had to say. † Continuation of the holy Gospel according to St. Luke. At that time: Elizabeth was filled with the Holy Ghost, and she cried out wiht a loud voice, and said: Blessed art thou among women, and blessed is the fruit of thy womb. And whence is this to me, that the mother of my Lord should come to me? For behold as soon as the voice of thy salutation sounded in my ears, the infant in my womb leaped for joy. And blessed art thou that hast believed, because those things shall be accomplished that were spoken to thee by the Lord. And Mary said: My soul doth magnify the Lord. And my spirit hath rejoiced in God my Savior. Because He hath regarded the humility of His handmaid; for behold from henceforth all generations shall call me blessed. Because He that is mighty, hath done great things to me; and holy is His Name. And His mercy is from generation unto generation, to them that fear Him. Hear the homily in the embedded player below, or check for it in the SoundCloud app if you have installed it on your mobile device. Be sure to follow GrottoCast on SoundCloud. Fr. 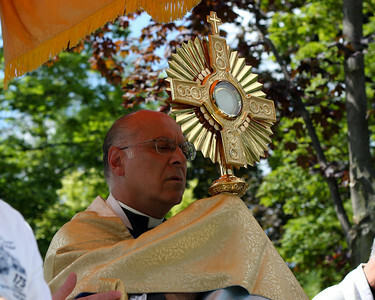 Perrone’s homily from Sunday, August 16, 2015, on the Eucharist, should be available tomorrow, so check back.